This 4Days Uganda wildlife safari takes you to Lake Mburo National Park and Queen Elizabeth National Park, Uganda’s second largest national park after Murchison Falls National Park gifted with plenty of wildlife, birds for Uganda birding safaris and primates. Queen Elizabeth National Park has spectacular exciting sceneries including crater Lakes and systematic savannah plains overlooking the all year-round snow-capped Rwenzori Mountain ranges. Visiting Queen Elizabeth National Park gives you chance to enjoy game drives in the park, a boat cruise along the Kazinga channel and chimpanzee trekking Uganda in the Kyambura gorge. Lake Mburo National Park is the only place in Uganda where Impala can be found and the best place to see large herds of Elands (Africa’s largest Antelopes). Lake Mburo National is also the only park where a guided game walk is possible. 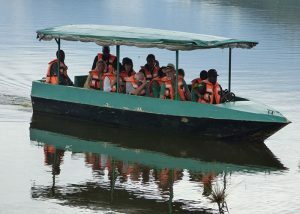 Day 1 of the 4Days Uganda wildlife safari: Transfer from Kampala to Lake Mburo National Park for an afternoon boat cruise with en route to the Equator in Kayabwe and Mbarara for lunch. Day 2 of the 4Days Uganda wildlife safari: Do a morning game drive in Lake Mburo National Park, have lunch and transfer to Queen Elizabeth National Park or your dinner and over night stay. Day 3 of the 4Days Uganda wildlife safari: Do a morning game drive in Queen Elizabeth National Park, and do an afternoon game drive along the Kazinga Channel. Day 1: Transfer from Kampala at 7am to Lake Mburo National Park for an afternoon boat cruise with en route to the Equator in Kayabwe and Mbarara for lunch. Travel to Lake Mburo National Park Uganda, 235km from Kampala driving for about 4-5hours without the stopovers. You will depart Entebbe international airport or Kampala in the morning after breakfast. You will be picked by your Uganda safari guide, who will take you through a short briefing about your 4Days Lake Mburo National Park and Queen Elizabeth National Park Uganda wildlife safari. You will then travel westwards through Uganda’s beautiful green scenery heading to Lake Mburo National Park. 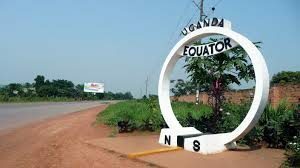 You will have a break in your journey at the Equator for an opportunity to stand in two hemispheres at the same time, have a polar water experiment, as wells have look at the souvenir shops with lots of art and craft makings. You will continue through the savannah grasslands with lots of banana plantations and several herds of local long horned Ankole cattle endemic to this part of the country. 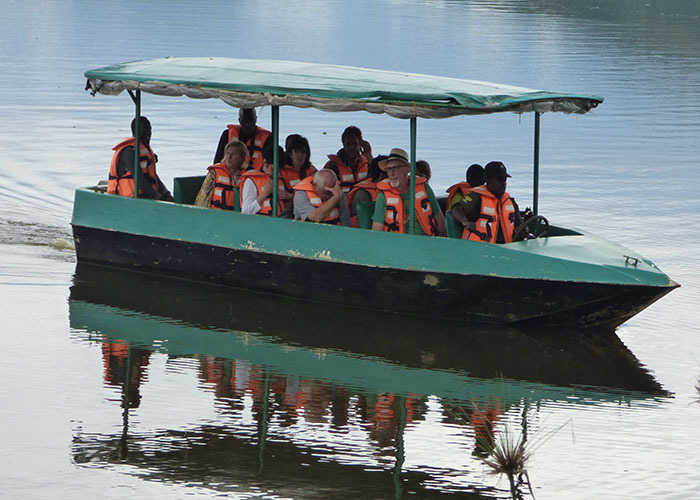 You will have lunch in Mbarara at Igongo Hotel and then continue with your journey to Lake Mburo National Park for your afternoon boat at 2pm along Lake Mburo rich with a variety of animals such as hippos and crocodiles and bird species. After the boat, you will check in your accommodation for dinner and overnight stay. Day 2: Do a morning game drive in Lake Mburo National Park, have lunch and transfer to Queen Elizabeth National Park or your dinner and overnight stay. You will wake up early in the morning, and prepare for your early morning game drive in Lake Mburo National Park for about 2 to 3 hours starting at 7am. After the game drive you will go back for breakfast and freshen up. After breakfast you may decide to do horse riding, quad biking, a nature walk or cycling before you proceed to Queen Elizabeth National Park. Day 3: Do a morning game drive in Queen Elizabeth National Park, and do an afternoon game drive along the Kazinga Channel. You will set off early from your hotel at about 6.30am for a morning game drive, an awesome experience to spot the animals in natural habitats. Expect to see 4 of the famous Big Five game; Elephant, Buffalos, Lions, Leopards and others including Bush bucks, Kobs, Giant forest hog, Hyenas leopards, antelopes, and Waterbucks as well as birds. You will return for breakfast and relax till lunch. In the afternoon you will take a launch cruise along the amazing Kazinga channel to see the water animals like Hippos, Buffalos, Crocodiles and elephants’ bathing on along the channel banks. Kazinga Channel also has variety of bird species on the water banks especially the pelican and Jacana. The boat cruise takes about 2-3 hours. Retreat from the activity and return to your hotel/lodge for your dinner and overnight stay. After Breakfast at the lodge, you will embark on your 7 hours journey back to Kampala or at Entebbe International airport for your late evening flight.